Magnet’s portfolio of space saving Eaton motor control and protection devices offer motor starting and protection solutions in diverse industries, including mining, oil and gas, pulp and paper, the automotive sector and general utilities. “This range, which encompasses contactors, circuit breakers and overload relays, has been designed for easy installation and simple set-up, increased accuracy, greater visibility into the motor status and a higher degree of protection,” says Magnet Group managing director, Brian Howarth. “Eaton motor control and protection products efficiently meet the demands of challenging applications, including motor control centres, field starter panels and heavy duty pumps, as well as conveyors, fans, pumps and compressors. 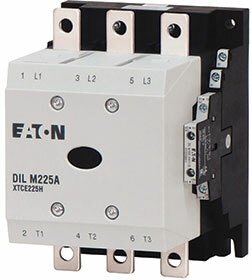 DILM contactors for utilisation category AC-1/400V are rated for normal switching duty for 3-pole, non-motor loads. Operating characteristics include non-inductive and slightly inductive loads and electrical characteristics for switch on and switch off are 1 x rated operational current. Typical applications for this range are for electric heaters. DILM contactors the AC-3/400V utilisation category are rated for normal switching duty for AC induction motors. Operating and electrical characteristics are switch on from stop at up to six times the rated motor current and switch off during run, at up to 1 x rated motor current. Typical applications include compressors, lifts, mixers, pumps, escalators, agitators, fan conveyor belts, centrifuges, hinged flaps, bucket-elevator air-conditioning systems and general drives for manufacturing and processing machines. DILM contactors for utilisation category AC-4/400V are rated for the extreme switching duty of squirrel-cage motors. Operating characteristics are inching, plugging and reversing. Electrical characteristics for making and breaking the current are up to six times the rated motor current. Typical applications include printing presses, wire-drawing machines and centrifuges, as well as for special drives used for manufacturing and processing machines. Magnet offers a technical and advisory support service throughout the country.